Cardinal Health's (CAH) stock price has slumped nearly 40% over the last two years, driving its dividend yield to a record high of 4.4% in late 2018.
Dividend aristocrats such as Cardinal Health are often owned under the assumption that they will generate safe, growing income while recording healthy total returns and low stock price volatility compared to the broader market. However, not all aristocrats live up to the group's impressive long-term track record. Cardinal Health's weak performance has some investors wondering if the market might be signaling that the company's dividend has become unsafe, or at the very least that the firm's long-term growth prospects have dimmed. Let's review why the market has been so bearish on Cardinal Health and evaluate the company's dividend safety and outlook. While Cardinal Health and its two largest rivals McKesson and AmerisourceBergen dominate the pharmaceutical distribution market, this middleman business is known for its razor-thin margins. In fact, Cardinal Health's operating margin has remained below 3% each year for more than a decade. Yet despite the low profitability of this industry, through fiscal 2017 Cardinal Health enjoyed strong growth in both its bottom line and dividend. Unfortunately, that might have created an unrealistic expectation for some investors that such a fast pace of growth was sustainable over the long term. Between 2012 and 2017, a record amount of patented drugs lost patent protection, resulting in many generic drugs hitting the market. This not only increased volumes for Cardinal Health's pharmaceutical distribution business (about 85% of operating profits), but generic drug prices also spent much of that time rising, which boosted margins significantly. Simply put, the stars aligned to help the firm enjoy a golden age of profit and dividend growth. 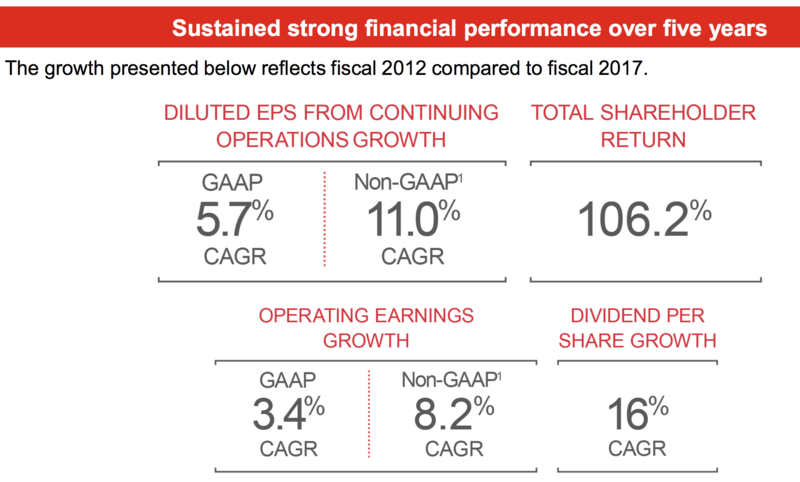 However, in recent years generic drug prices have reversed course and resulted in Cardinal's adjusted earnings stalling, despite continued steady growth in revenue (margin compression). As we noted in our full investment thesis, most of the pharmaceutical value chain is under pressure to cut costs and make healthcare more affordable. As a result, many pharma businesses are moderating price increases on their drugs in response to increased political pressure. Generic drug prices have also been hit because of faster approvals by the Food and Drug Administration (resulting in more generic drug supply) and a price-fixing investigation, according to The Wall Street Journal. 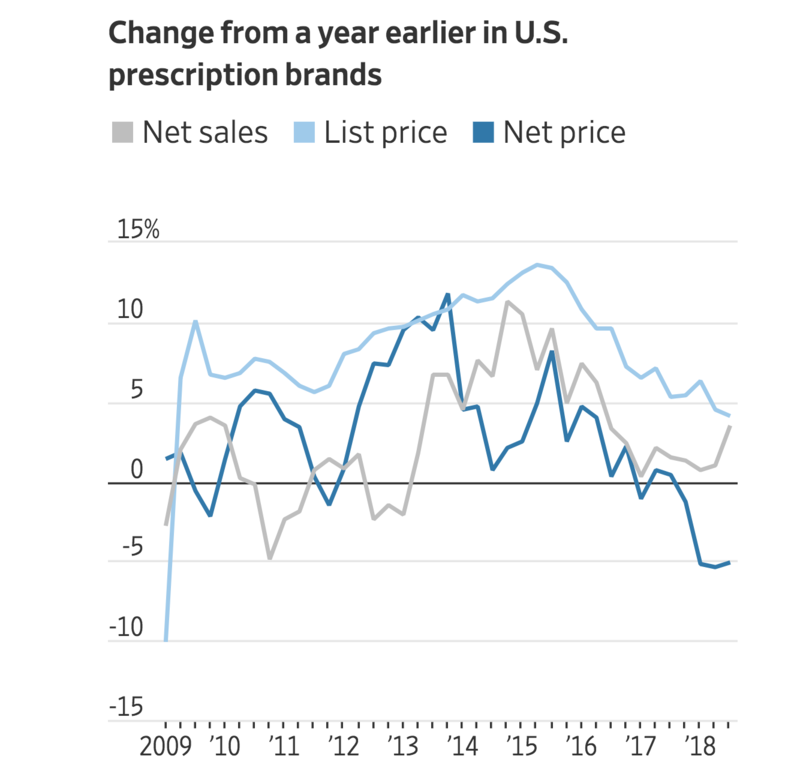 As you can see below, courtesy of The Wall Street Journal, average net prices drugmakers realize after rebates and discounts have actually declined over the past year. With no end in sight to this headwind, Cardinal Health has had to restructure its business model and refocus on other growth areas, and the firm's turnaround is expected to continue in 2019. 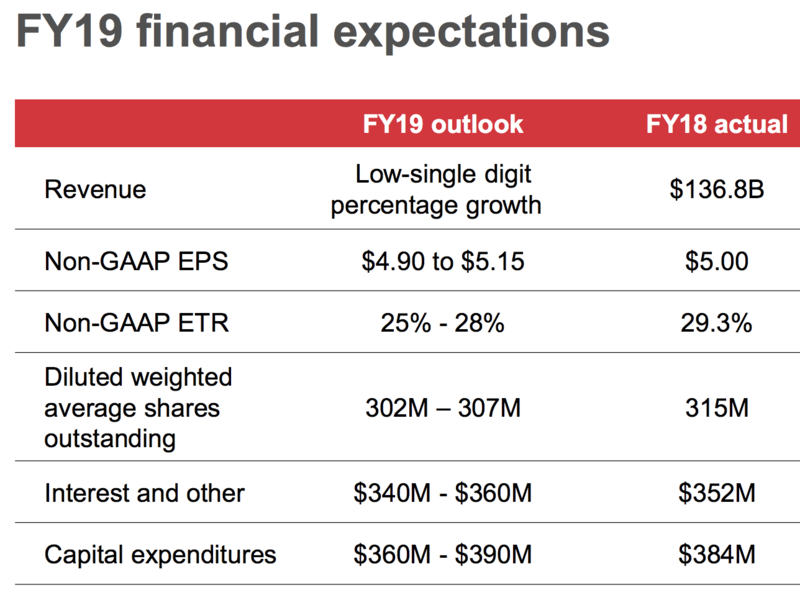 Cardinal Health's guidance for fiscal 2019 calls for only modest revenue growth (about half as fast as recent years) and about 1% adjusted EPS growth. And that's despite management's plan to repurchase about 3% of the company's stock through its buyback program. As the company's CFO Jeorge Gomez explained on the firm's first-quarter fiscal 2019 conference call, "generics deflation will continue to be a headwind for the rest of the year." In other words, Cardinal's growth struggles are unlikely over. Per FactSet, analysts expect the firm's free cash flow to fall nearly 20% this year and won't return to growth until 2020, in part due to the company's struggles with its major growth driver outside of pharma, medical products. In 2015, Cardinal Health spent $2 billion to buy Cordis, Johnson & Johnson's (JNJ) cardiac medical device business. Then, in 2017, it bought Medtronic's (MDT) medical supply business for $6.1 billion. Cardinal Health's medical segment enjoys much higher margins than its pharma business, but these acquisitions have caused some major headaches as well. The Cordis deal has been plagued by supply chain issues that resulted in $1.4 billion in write-downs (of excess inventory), for example. In addition, in 2017 the company sold its Chinese health business after admitting that this initially promising growth catalyst wasn't going to work out. Big acquisitions don't always deliver long-term shareholder value. "In terms of cost, we are on track to deliver targeted annualized cost savings of $100 million in fiscal 2019, and in excess of $200 million by the end of fiscal year '20. And we continue to take a hard look at how we can operate even more efficiently. At Cordis, our stabilization program is on track. The team has made meaningful progress and we are seeing improvements in inventory management, demand planning and cost. At the same time, the team is taking steps to optimize Cordis' product offering and global footprint to drive higher profitability. We remain confident that Cordis will be on a path to profitable growth by the end of fiscal year '19. Cardinal's fiscal year ends in August, so within three quarters Cordis's issues are expected to be resolved, and $100 million of cost savings should help the medical segment's operating margins improve. 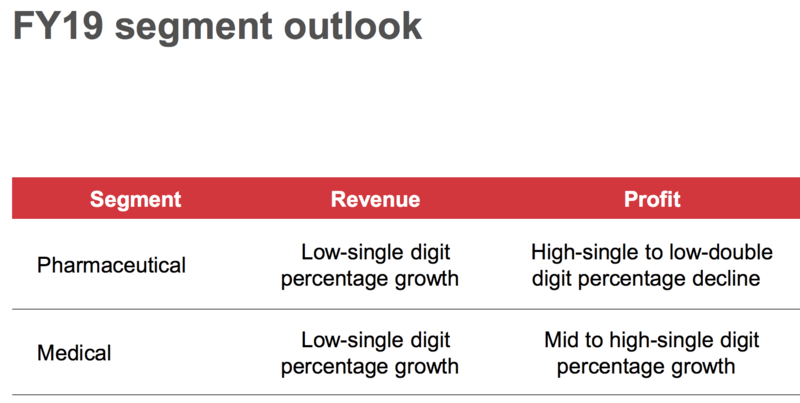 While that improvement is still not enough to drive overall earnings growth in 2019, an additional $200 million in cost savings next year is why most analysts believe Cardinal will achieve modest bottom line growth in 2020 and beyond. A return to earnings growth would be a welcome development, but Cardinal Health's pharmaceutical distribution business faces some major headwinds that might persist longer than investors expect. Weak generic drug prices have yet to stabilize, and management is unsure when they will. And even when generic prices (and margins) stop falling, they are very unlikely to ever return to their much higher levels of 2016 and 2017 due to continued consolidation across the pharmacy industry, where Cardinal's biggest customers reside. Safeway, Walgreens (WBA), and CVS (CVS) have been playing the big three drug distributors off each other, just as drugmakers have increased the amount of scrutiny on the industry's middlemen. As a result, the best Cardinal might be able to hope for is that generic prices merely stabilize and then stay flat for the foreseeable future. Cost cutting on that side of the business (from expanded economies of scale) would have to make up the slack to drive stronger margins in the future. Meanwhile, the medical device segment, while growing nicely and experiencing relatively less pricing pressure, has come at the cost of much higher debt levels thanks to $8 billion in acquisitions. Cardinal Health could afford these deals since its business was in great financial shape. 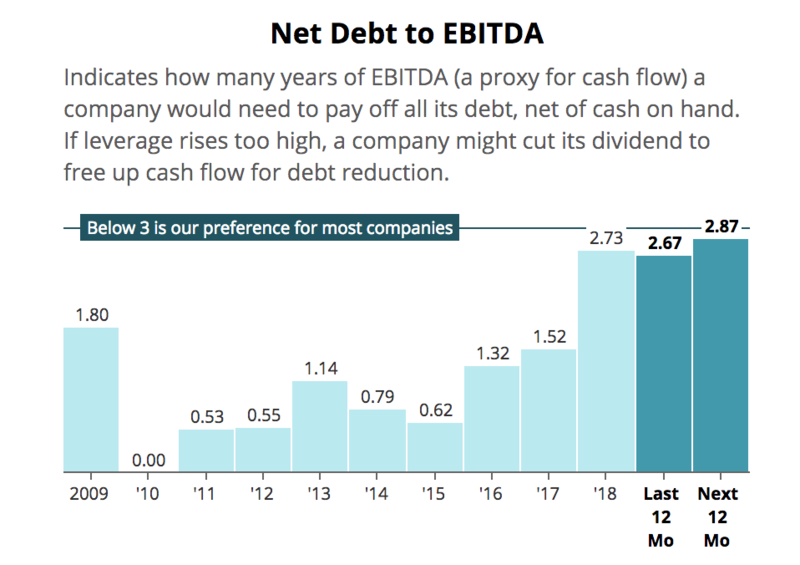 While the firm's net debt / EBITDA ratio still isn't dangerous, you can see that there is much less flexibility going forward. Management needs these acquisitions to work out given the lower margin of safety. Even assuming management delivers on its $300 million in cost-cutting savings and fixes the supply chain issues at Cordis, future growth in free cash flow will have to go largely to paying down its debt levels. Otherwise, Cardinal Health could risk losing its strong BBB+ credit rating. Fortunately, even despite the challenges Cardinal Health has faced in recent years, its free cash flow payout ratio over the last 12 months sits below 40%. 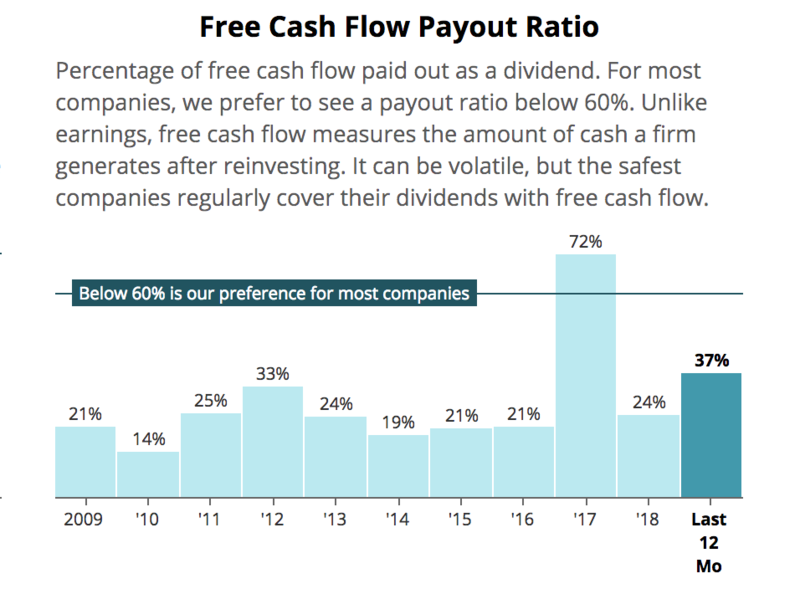 Even if analysts are right that free cash flow is going to take a hit this year (due to the final year of turnaround costs), the dividend is very likely safe. 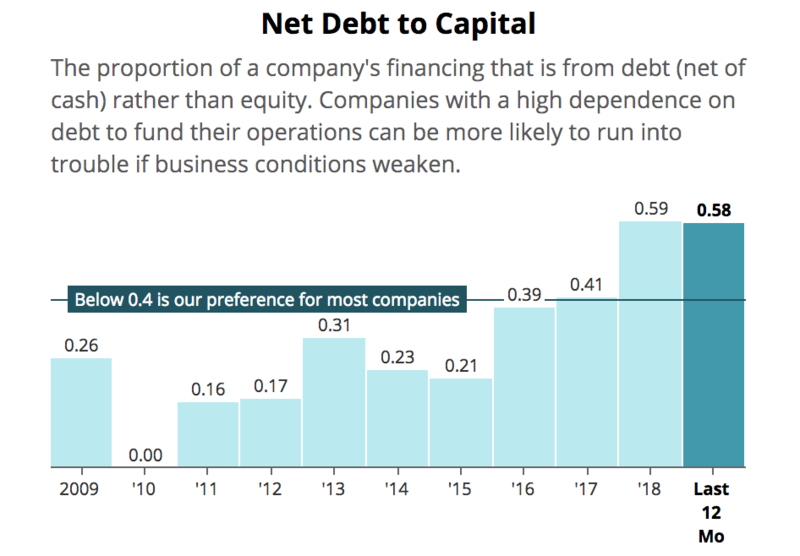 However, Cardinal's need to pay down debt and continue adapting its business model means that investors are likely to receive minuscule (low single-digit) dividend increases for the foreseeable future. It's important to remember that past performance is no guarantee of future results. Cardinal Health's dividend aristocrat status is impressive, but no company is assured to thrive in the dynamic healthcare industry. While Cardinal's business model hasn't deteriorated to the point where its dividend appears at risk, the company faces some major challenges in the coming years in terms of returning to stronger growth. Most notably, the low-margin nature of its business model, when combined with uncertainty about the future of the medical sector, means that even this dividend aristocrat may not be suitable for highly conservative income investors. We prefer to own businesses with greater pricing power, more controllable competitive advantages, and numerous opportunities for long-term growth. Although Cardinal Health’s relatively low valuation may look tempting, it appears to be more of an acknowledgement of the company’s structurally lower growth profile and the risks faced by management’s debt-fueled expansion into medical products. Therefore, anyone interested in this business needs to have realistic growth expectations, as well as be patient enough to possibly endure another year or two of underperformance (and slow dividend growth) while the turnaround hopefully gains traction. Given the changes taking place in the industry, our preference would be to seek out companies with more predictable outlooks.